When you think of a trip to Meghalaya, the places you hear about are the well-known destinations. The destinations which are placed on the tourist map. But very few ask for something fresh, something thrilling. Meghalaya, known for its surprising nature hosts some awe-inspiring destinations in the interiors. One such place is Wahkhen and the trek to U Mawryngkhang. Some 50 km from Shillong, lies Wahkhen, a small hamlet in the interiors of East Khasi Hills. On the road to Dawki, a right cut from Pomlum Village takes you to off the beaten track to Wahkhen (Some 20 Km from Pomlum Village). A newly placed direction sign board will help in case you deviate from your course. *NOTE – There is no public transport available from Pomlum Village to Wahkhen. You can get shared taxi from Shillong to Pomlum (Costs Rs 90 only). The Khasi tribe of Meghalaya has been passing their teachings through storytelling from a long time. It can be reflected by the myths and legends you hear about. Such is a story of U Mawryngkhang, the King of Stones who fell in love with a girl from another kingdom, Mawpator. A battle ensued between the two, U Mawpator injured Mawryngkhang. However, Mawryngkhang succeeded in beheading Mawpator. His head fell down in the river gorge, which can be seen from the view point. And Mawryngkhang, today stands as the famous rock. Wahkhen is a new attraction for the travellers looking for adventure, the reason being – it is the starting point for the trek to U Mawryngkhang – The King of Stones. A small village with a population of around 1000 people also retains a traditional Music School lined with musical instrument of different types. The Music school offers teachings of traditional music once a week. The school resembles a traditional Khasi hut. *NOTE – Wahkhen doesn’t offer any stay option for the tourists. But if you are lucky enough, you might get the permission from the villagers to stay in some place (possibly the Music school). The trek to U Mawryngkhang starts with a bamboo trail leading to a rough stony path till you reach the cleanest river in the region ‘Umrew River’. 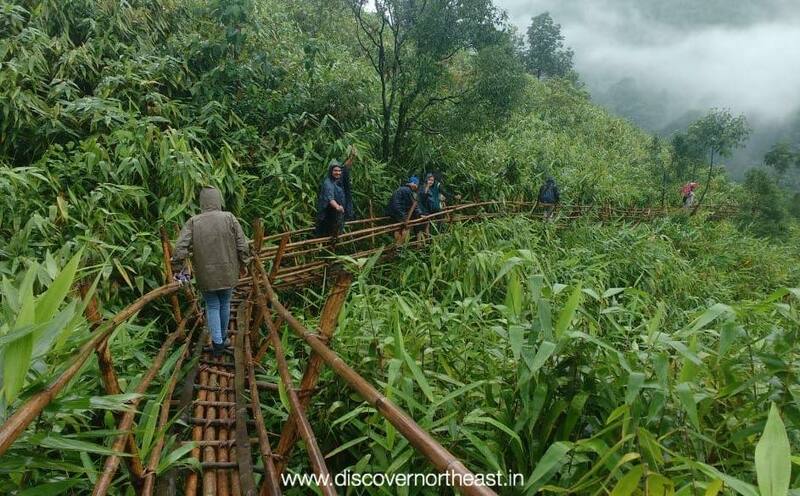 Thereon the adventurous journey starts with crossing the river on a C shape bended bamboo bridge further leading to stony path. The Umrew river follows the trail all the way through. The trail leads you through some scary bamboo bridges on the ridges of the rock for most of the trek. It scares you off as you look down and find out that the bridge is the only life support between you and the valley. It gives you the Goosebumps while you trust the bamboo bridge to hold on. 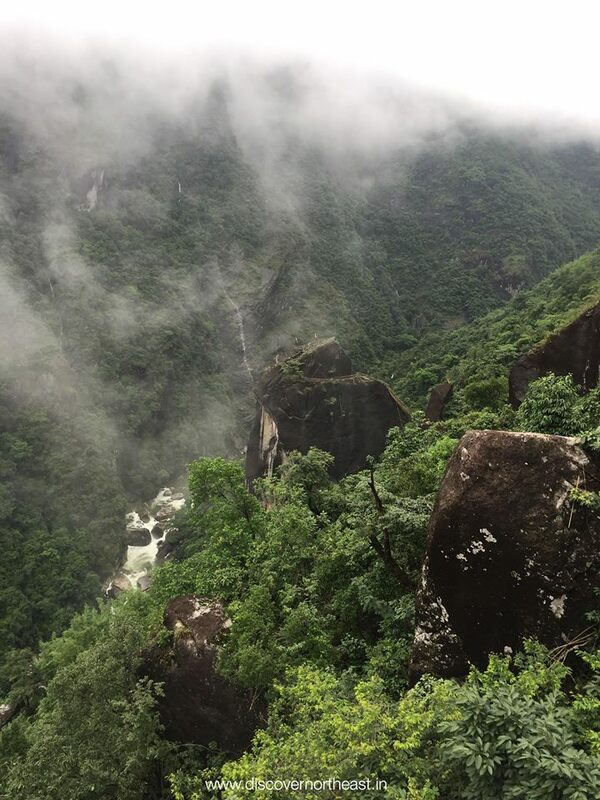 In the course of this scary trek, you cross through some water linings coming down from the mountains and falling on you, some astounding waterfalls and amazing view of the valley. This relieves you from the scary part. The trek becomes a bit difficult until you reach the view point from where U Mawryngkhang is visible standing tall, isolated from the rocky cliffs nearby. The final stretch to reach Mawryngkhang is the toughest of all, where you climb through some bridges made of bamboo and woods. This is the moment when you realize what you just achieved. A moment when you place your footsteps on the great Mawryngkhang. The view of the river gorge from Mawryngkhang is captivating and doesn’t let you leave without a picture. *NOTE – Mawryngkhang is believed to be a sacred place for the locals. Violation of any rules will be punishable by the villagers. This 3 hour trek (both side) is a complete package of thrill and adventure one looks for. You may have your experiences but the trek to Mawryngkhang beats all. 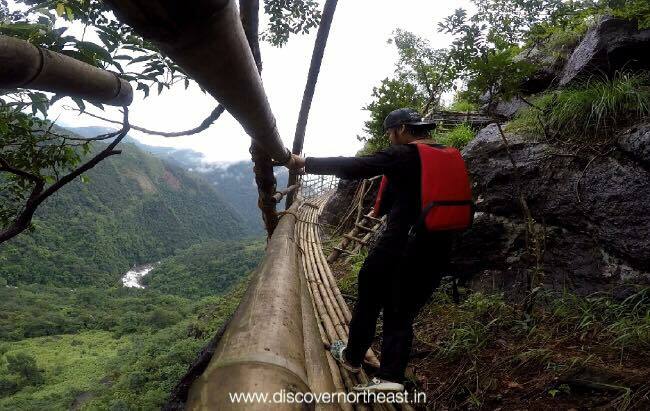 The bamboo bridge is an example of the finest architecture by the locals and is not advisable for the faint-hearted to trek on. * Wahkhen is being introduced as a new destination on the tourist map in Meghalaya. This commendable job is a hard work of the villagers who made this happened without the support of Government. The villagers initiated to build a bamboo trail all by themselves. It took them a year to complete it. The government commended the efforts of the villagers and promised to promote Wahkhen as the new destination. Hi..If going by shared transport till Pomlum,how to reach Pomlum Village to Wahkhen. Also are there any accommodation facilities available in Pomlum?